In 1959, three years before independence, the majority ethnic group, the Hutus overthrew the ruling Tutsi king. Over the next several years thousands of Tutsis were killed, and some 150,000 driven into exile in neighboring countries. The children of these exiles later formed a rebel group, the Rwandan Patriotic Front (RPF) and began a civil war in 1990. The war, along with several political and economic upheavals, exacerbated ethnic tensions culminating in April 1994 in the genocide of roughly 800,000 Tutsis and moderate Hutus. The Tutsi rebels defeated the Hutu regime and ended the killing in July 1994, but approximately 2 million Hutu refugees - many fearing Tutsi retribution - fled to neighboring Burundi, Tanzania, Uganda, and Zaire, now called the Democratic Republic of the Congo (DROC). Since then most of the refugees have returned to Rwanda. Despite substantial international assistance and political reforms - including Rwanda's first local elections in March 1999 - the country continues to struggle to boost investment and agricultural output and to foster reconciliation. A series of massive population displacements, a nagging Hutu extremist insurgency, and Rwandan involvement in two wars over the past four years in the neighboring DROC continue to hinder Rwanda's efforts. Rwanda is a rural country with about 90% of the population engaged in (mainly subsistence) agriculture. It is the most densely populated country in Africa; is landlocked; and has few natural resources and minimal industry. Primary exports are coffee and tea. 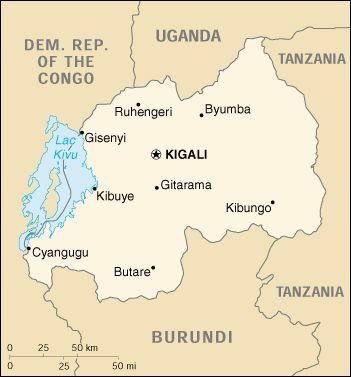 The 1994 genocide decimated Rwanda's fragile economic base, severely impoverished the population, particularly women, and eroded the country's ability to attract private and external investment. However, Rwanda has made significant progress in stabilizing and rehabilitating its economy. GDP has rebounded, and inflation has been curbed. In June 1998, Rwanda signed an Enhanced Structural Adjustment Facility (ESAF) with the IMF. Rwanda has also embarked upon an ambitious privatization program with the World Bank. Continued growth in 2001 depends on the maintenance of international aid levels and the strengthening of world prices of coffee and tea. many brownish or discoloured beans.